What can be said about a loudspeaker as expensive as this? Obviously competent in all areas, the BeoLab 5 fitted in at the top of the BeoLab loudspeaker range, combining unusual styling with large numbers (both technical and financial) to create a lasting impression. Text copyright © Beocentral. Unauthorised reproduction prohibited. It had long been understood that to fill large rooms with quality sound large loudspeakers were necessary. B&O had traditionally offered powerful amplifiers along with large loudspeakers to play them through, but this broadly ideal technical solution brought problems of its own. The original models, such as the Beovox 5000 series, took the form of large wooden boxes, well finished but difficult to fit neatly into a domestic surrounding. This did not constitute a problem during the period when very large loudspeakers were fashionable and clearly communicated that the owner was a serious listener who knew a thing or two about music, but when tastes changed they were no longer such an attractive proposition to all but the very dedicated. B&O’s answer to this problem had been the column loudspeaker, typified by the Beolab Penta series. An excellent solution in many ways, the drawback of all column loudspeakers was that the maximum diameter of each drive unit is quite limited, and for full-toned bass reproduction a large diameter drive unit is usually preferable to a number of small ones. A further problem for B&O was that with heightened standards of competence across the industry in general, it was no longer sufficient to produce something that was merely “quite good” and well made. Being visually distinctive was important too. Text copyright © Beocentral. Unauthorised reproduction prohibited. A solution to the latter problem arrived in the shape of the acoustic lens. This licensed technology breathed new life into the idea of suspending a cone shaped or otherwise pointed structure over a horizontally mounted driver. This technique first appeared in popular products during the 1960s and has been “rediscovered” in every subsequent decade, usually with the same claims of wider dispersion and a clearer stereo image which is less sensitive to the position of the listener. The innovation this time around was that of refined computer analysis of the shapes, though the drive units themselves were fairly conventional dome types. The two acoustic lenses were positioned one above the other and separated by large aluminium discs, forming an undoubtedly distinctive shape with no particular acoustic disadvantages when compared to more conventional designs. The aim of wide treble dispersion was indeed an admirable one, though it has to be said that few natural sounds emanate from such structures, in contrast to the “point source” of a conventional tweeter which is quite common. Text copyright © Beocentral. Unauthorised reproduction prohibited. The other acoustic feature of the BeoLab 5 was the bass. By building a subwoofer into each cabinet it was possible to generate an enormous amount of power in the lower registers, and although it was not strictly necessary to have two subwoofers for a domestic loudspeaker system the effect could be pleasing if it wasn’t overused. The drivers themselves were 15” in diameter, the largest yet seen in a domestic B&O loudspeaker. A second, smaller, bass driver was also fitted, though this was less than half the size at 6.5”. To house the large drive units in a profile which complemented the aluminium discs at the top of the cabinet, the large subwoofer was placed facing downwards in a tapering section covered in black cloth. The smaller driver was mounted above and faced forward, the only one of the four drivers to actually point towards the listener. Text copyright © Beocentral. Unauthorised reproduction prohibited. 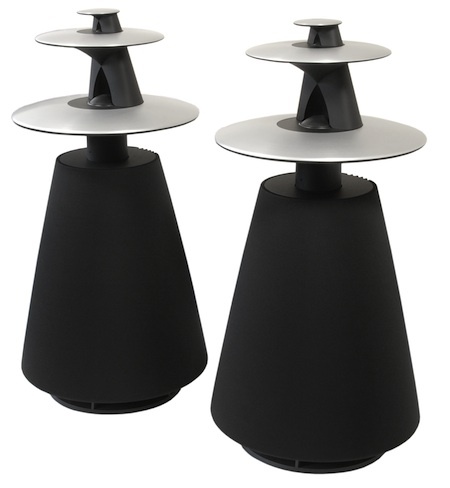 Like all recent B&O loudspeakers, the BeoLab 5 was an active design, containing its own power amplifiers and electronic crossover. The crossover contained an interesting feature, a self-calibrating mode which optimised the bass response of the loudspeaker to its room surroundings by playing a series of internally generated test tones and sampling back the resulting sound through a small built-in microphone. The microphone emerged from the base of the loudspeaker automatically when the sequence was initiated by touching the very top of the loudspeaker. The process involved was similar to that used in the Beocord 9000 self-calibrating cassette deck of twenty years earlier, and might be seen as a complicated way of dispensing with the “corner/wall/free standing” switch that was usually fitted to the larger BeoLab loudspeakers. Text copyright © Beocentral. Unauthorised reproduction prohibited. The amplifiers in the BeoLab 5 were all of the class D type and capable of truly colossal outputs, 1000W each for the two bass units and 250W each for the midrange and tweeter units mounted at the top. Used simultaneously, the power required would have approached the maximum available from a conventional European wall socket, but in practice this was never likely to happen. Just like the super-powerful saloon cars that were a feature of Europe’s roads at the time, the actual need for, or use of, a 2500W domestic loudspeaker was not explained in B&O’s literature, the figures spoke for themselves and the owner’s good sense was relied upon from that point forward. Text copyright © Beocentral. Unauthorised reproduction prohibited. The BeoLab 5 was launched to universal critical acclaim, and although expensive was generally considered to offer a fair amount of “content” in return for its high price. The only problem was that a loudspeaker of such undoubted quality would inevitably raise the question of what to connect it to, as by this time all the serious Hi-Fi products in the B&O range had gone. Text copyright © Beocentral. Unauthorised reproduction prohibited.